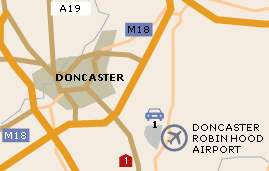 Airport Parking offers a wide range of options for parking at Doncasater Airport. With both on and off-airport options, there will be something on offer to suit every need and budget. For a quote please click here. So as well as being a more convenient option, it may also be easier on your finances. To view the hotels on offer at Doncasater Airport and get a quote please click here. There is a Costa Coffee in landside arrivals. There is also a Bar 08 and another Costa Coffee in the departure lounge. More cafes and restaurants will be available once phase 2 development of the airport is completed. An executive lounge will be available following phase 2 of redevelopment. The airport is home to a variety of shops on both the ground and first floors, including tax and duty free shops in the departure lounge. There are various toilets in several locations across both floors of the terminal building. These toilets include disabled facilities. The information desk is located on the ground floor of the terminal building, towards the left hand side as you walk in. The whole ground floor of the terminal operates a non-smoking policy, but there is a designated smoking area in departures on the first floor. Little Arrows Taxis has a booking desk situated in arrivals. There are several car hire desks situated on the ground floor of the terminal building. Luggage trolleys are available from the points by the entrance.